FlightStats.com reports that airlines posted an 80 percent on-time rate for the month of February, which represents a significant jump from last year’s 75 percent. More importantly, several airlines improved their numbers, including American, which of late has made a concerted effort to be punctual. The carrier was on schedule 80 percent of the time, a huge spike over last year’s dismal 69 percent. So chances are your flight arrived on time last month. If so, you can thank capacity cuts, which have made it easier for airlines to stay on schedule, and relatively calm weather for the month. FlightStats points out that March began with snowstorms, meaning numbers could dip, but it’s possible we’re witnessing a trend because airlines are trying harder to be on time. We’ll see. The lone dark cloud hovering over February’s number comes courtesy of New York. Newark (58 percent on-time rate) came in dead last among the 40 airports FlightStats surveyed, and LaGuardia (67 percent) was third to last. JFK (76 percent) was also in the bottom ten. Clearly New York remains a bottleneck, and it’s fair to say it’s only going to get worse. If you flew last month, please share your experience in a comment below. Did your flight arrive on time? 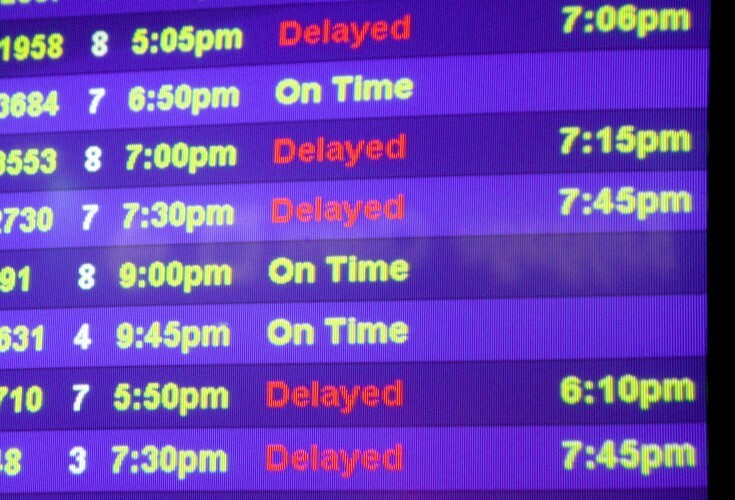 Were you stuck in one of the New York area airports? Do you think airlines are doing a better job of staying on schedule?